Blog Polls Are Back On Facebook! We. Are. Excited! Back in the day, using Facebook polls on a Page were a fun and easy way to engage with followers. Then Facebook got rid of the feature for Pages, but kept it in Facebook events. Polls were one of our favorite features on pages, so we were pretty sad when this happened. 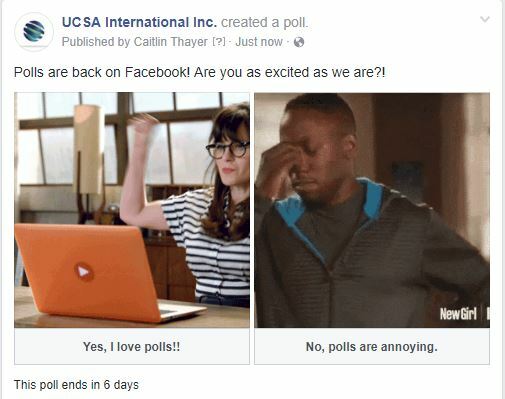 Facebook polls are back and better than ever! Now you can add images and gifs to your polling options which will increase overall engagement and views. It’s not just for Facebook Pages either; now users can create their own polls and poll their friends for fun. Check out this Adweek article for a step-by-step guide to creating and using Facebook polls for your page or profile. Have an upcoming event where you’re deciding on a menu? Let people vote for which dessert they’d prefer (and also link to a place where they can buy tickets). Hiring a speaker for a lecture and want to know who would be more popular? Post a couple of options and see which would bring you more ticket sales. Having a new logo made and can’t decide between two options? Let your followers help you! There are so many fun and creative things you can do with polls. So the next time you’re in a staff meeting and could use some outside input on something, think about using a Facebook poll! Your followers will love that you’re asking for their help. After you publish your poll, you’ll even be able to see the names of the people who voted for each option! What’s the first poll you’re going to run? Comment below with a link so we can come vote! Caitlin brings over 10 years of professional social media and marketing experience to UCSA. She has worked with organizations of all sizes – from start-ups to international businesses. When Caitlin isn’t in the office, you can find her spending time in Amesbury with her husband Joshua, at the beach, or hiking New Hampshire’s 4,000-footers!